Now that the end-user market seems to be accepting the cloud option, the major players are stepping up their game. JDA began their version of the cloud journey several years ago, which initially targeted infrastructure challenges and helped to reduce IT operations costs. Recently, JDA announced expansions to their existing cloud service—JDA Cloud Optimize—which has several new components. Cloud Optimization is a service JDA has been evolving since launching the cloud business (see JDA Focus 2012: Cloud Strategy). Logility also just announced their cloud approach, Logility Cloud Services. These cloud strategies vary, so it is worth taking the time to explain some of the alternatives. 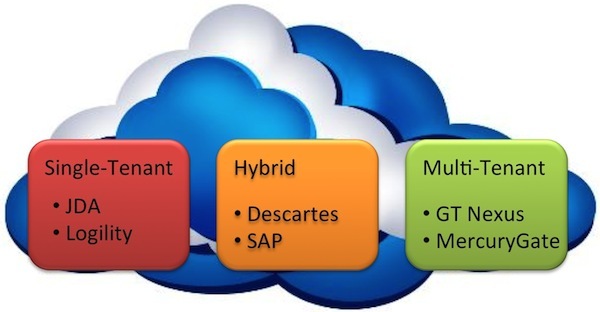 Figure 1 shows the cloud approach of some of the major providers of supply chain applications. Logility and JDA are ultra-important players in the supply chain market. And their path is different than many. We spent some time talking in-depth to both these companies about their approach and their path forward. Logility has been offering the SaaS option for transportation and Demand Collaboration for some time, but these services are expanding. Previously, Logility saw the cloud option requested by customers on their RFI,1 but customers did not follow through on purchasing that option. Now they are. These customers, due to the sensitivity of their market and planning data, tend to select the single-tenant/hosting option. Demand planning, in general, unlike transportation management has leaned toward the single instance environment. And interestingly, we do hear that for large number-crunching applications in analytics, merchandising, pricing, and large SKU-based forecasting applications, that some multi-tenants have some performance challenges. Demand collaboration,2 de facto, implies a shared platform between multiple trading partners. However, in a large company they run this as their portal, so they control access and the data. In comparison, for transportation management most other supply chain providers either were cloud/multi-tenant from day one (GT Nexus, MercuryGate), offered portal and exchanges (Descartes), or now provide a variety of options for their customers. In contrast to most other cloud software providers, JDA cloud services are not multi-tenant single instance architecture. JDA’s cloud offering is essentially hosting services with traditional perpetual license terms, on top of which they provide some optional, potentially very valuable managed services. They market these four levels of cloud services as: Launch, Perform, Optimize, and Evolve. So, let’s cover the easy stuff first. JDA’s Cloud Launch is a rapid implementation service for JDA’s hosted service for licensed, enterprise-specific instances of JDA customer installations. JDA provides the data center, the hardware (servers, networks, and capacity elasticity), operating system, middleware, JDA applications, application monitoring, and upgrades. i-Lab—a complete preloaded stack of hardware and software to create the initial go-live. Once the customer is live, i-Lab can continue to be used as a test and modification ‘lab’ before the customer rolls-over to a new upgrade. This sits on top of the hosting; customers can take advantage of JDA Cloud Perform which will fully administer their JDA environment. It also includes the performance management, security, and tuning that you would expect from your own in-house IT staff. JDA has stated that customers are saving money (and headaches) by doing this. Obviously, the scalability of a common environment can be an enormous benefit. But more important is the application-specific knowledge required to monitor and tune these applications. If you do merchandising and pricing, for example, you have some big number-crunching applications. Planning for and having the right amount of hardware for them is not trivial. So having the application provider manage this can be a big benefit in the ups and downs of seasonal or event-driven analytics. One additional benefit of Cloud Perform is that JDA can keep track of and manage updates and upgrades to your software, a thorny issue to coordinate with IT, who usually has many other priorities. Of course users still have their job to do, but they have a bit more freedom, I think, when working with a third party, to determine the schedule and manage these changes. Taking a broader approach, more deeply interwoven into the customers’ enterprise processes, is their Cloud Optimize, an integrated set of services for both mid-size and large customers. Here JDA leverages their Supply Chain expertise to help the users—not just IT services—to enhance the enterprise supply chain team’s productivity. One concept for Cloud Optimize customers to review—unique to JDA—is PODs. These are globally deployed, horizontal or solution/expertise-focused teams of JDA support people (see Figure 2) who can deliver expertise to help customers, not just in the traditional get-started approach most software companies provide, but with on-going advice—from education to advice on how to use your software better (what reports (or not), what algorithms might be best). In addition, they help their customers monitor usage, and use this information to help improve processes and system effectivenss. There are Solution Pods—knowledge about the applications—manufacturing versus retail for example, and customers’ specific processes; and Horizontal Pods—a regionally deployed helpdesk with expertise on workflow, hardware, etc. This is not a consulting approach, which consists of one or more meetings and materials-based projects. 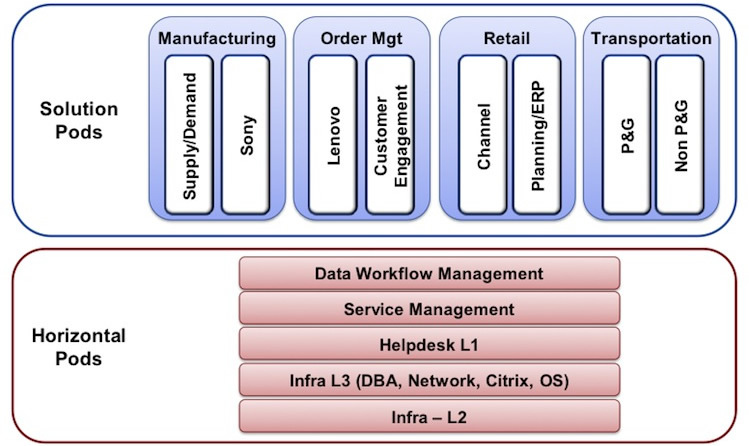 Rather these are ongoing, embedded services where each multi-disciplinary POD (see Figure 2) is dedicated to a group of customers with an SLA,3 for support over time. They are not taking over your planning processes, but acting as an extension of your team, giving an assist on maximizing the value of your software investment. It makes a lot of sense. JDA has built up a tremendous body of very specific expertise over time, which is hard to find in the broader labor pool. Having access to that expertise can thus be very valuable to a JDA customer. ChainLink wrote a few years ago about the Emergence of Managed/Co-Managed services. In this research, most of the companies we talked to wanted this type of service and more, but software companies were not providing it. When we interviewed some of the software companies, they made comments like, “that is low margin stuff,” or “profit on that kind of stuff is pennies on the dollar, not right for the software industry.” So it looks like JDA is closing the gap between what many customers want and someone who will actually provide it. While talking with Joe King, the VP who is responsible for JDA’s cloud business, he said the goal is that “JDA’s value to the customer should never wane.” Obviously, being a shared-service, hosted application, albeit with apps expertise was not enough. We agree. JDA has about twenty five customers to date using Optimize and this is growing, but of course it is not for everyone. Another area of JDA’s cloud is their TMS, an evolution of Trade Matrix, i2’s transportation network. Besides having a viable application software, having the connections between trading partners is fundamental to value, since in transportation the amount and complexity of shared information, transactions, and notifications is astounding. Many companies join multiple TMS cloud networks since they have to be connected to their customers’ preferred solution. Joe went on to say, “In reality, Cloud Optimize has very little to do with the cloud, but more to do with the long-term value we provide to customers.” JDA has put in place about 200 people to support this area, a significant investment, and more services will surely grow out of it once the PODs really scale. Part of JDA’s goal (and often, also customers’) is to keep customers more up to date on current—or at least recent—software versions. Old software is like stale food. You can use it, but it does not satisfy and has diminished nutritional value. But it is a challenge to stay current.5 It looks like JDA has found one way to help customers to keep the value they get from their software investments ‘fresh’ and competitive. 5 Read ERP’s Dilemma, in which the topic of upgrading is discussed. Of course, upgrading large, complex installations applies to many software sectors: Supply Chain, CRM, ERP, and many more.